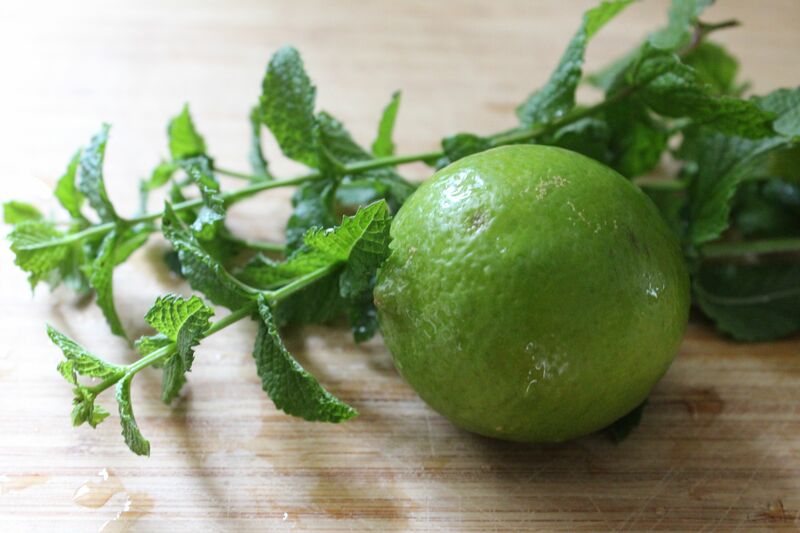 In celebration of National Water Quality Month, created to help remind us of the importance of protecting our water supplies, I wanted to share some recipes for herb-infused waters that are as healthful as they are delicious. 1. 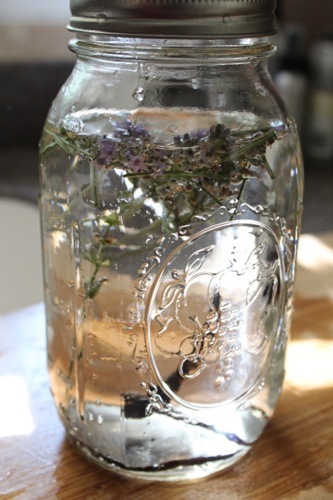 Place ingredients in a quart-sized canning jar and fill with cold, filtered water. 2. 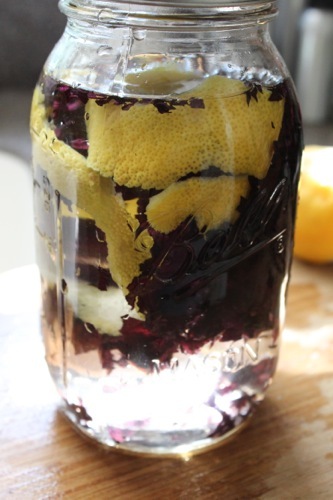 Allow the filled jar to sit, refrigerated, for 8-12 hours to allow the flavors to infuse. 3. 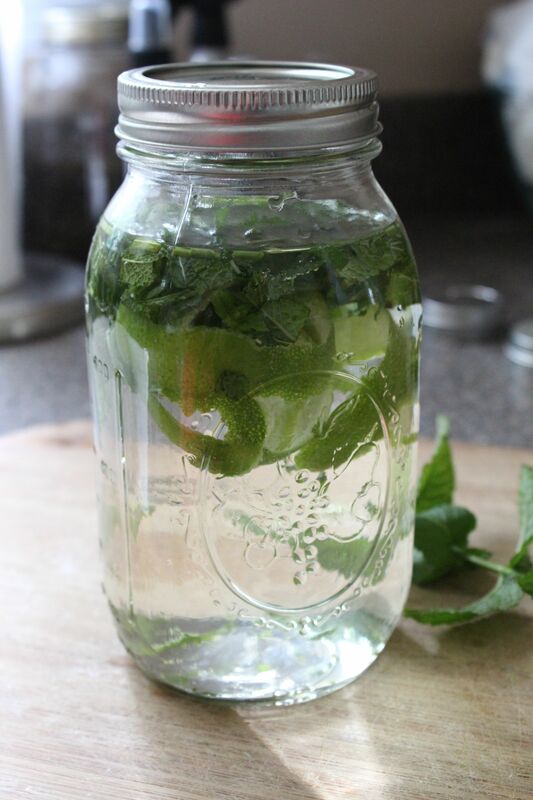 Strain out the ingredients and return the water to the jar. Keep the jar in the fridge to keep it chilled. It will last 2-3 days. 4. 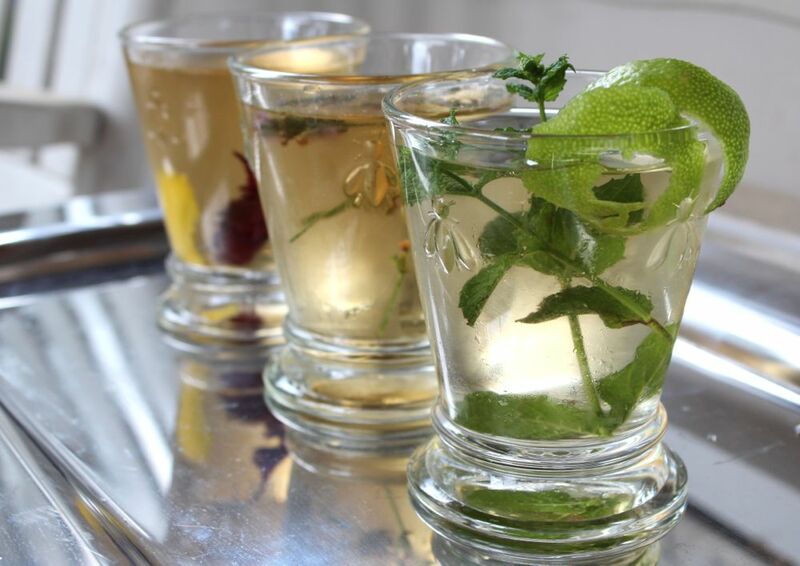 When serving, add some fresh sprigs of herbs or slices of fruit to your glass for a beautiful presentation. You can adjust the amounts of the ingredients for more intense or milder flavors. Have fun experimenting! In previous posts, I have shared my cold strawberry soup and my rose petal jelly recipes. 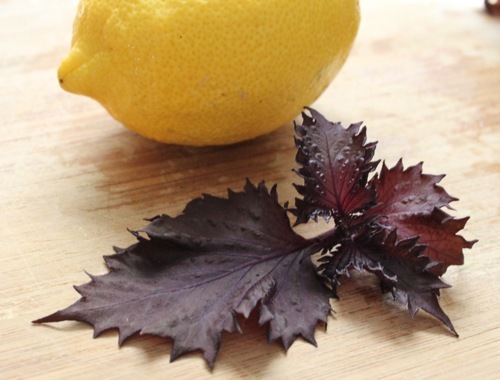 Today, after a fruitful trip to the farmers market, and noticing the abundant blooms on my rosebush, I was inspired to create a new recipe that combines the best of both of these springtime delicacies. The result was amazing. It is lighter and brighter tasting. Plus the roses add a certain je ne sais quoi. 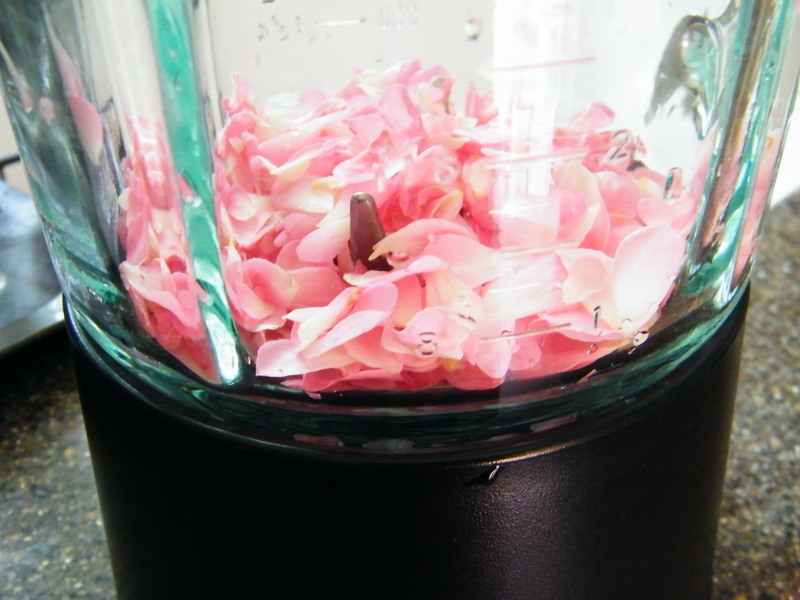 Rinse the rose petals, then place them in a blender. Only use roses that you are absolutely sure have never been treated with pesticides. It’s best to use ones that you have picked from your own garden (or that of your trusted friends and family). Wash, hull and halve the strawberries (you will probably use closer to 1 1/2 quarts, but it’s nice to have extras for garnish and for eating while you prepare the soup), then place as many as you can in the blender with the rose petals. 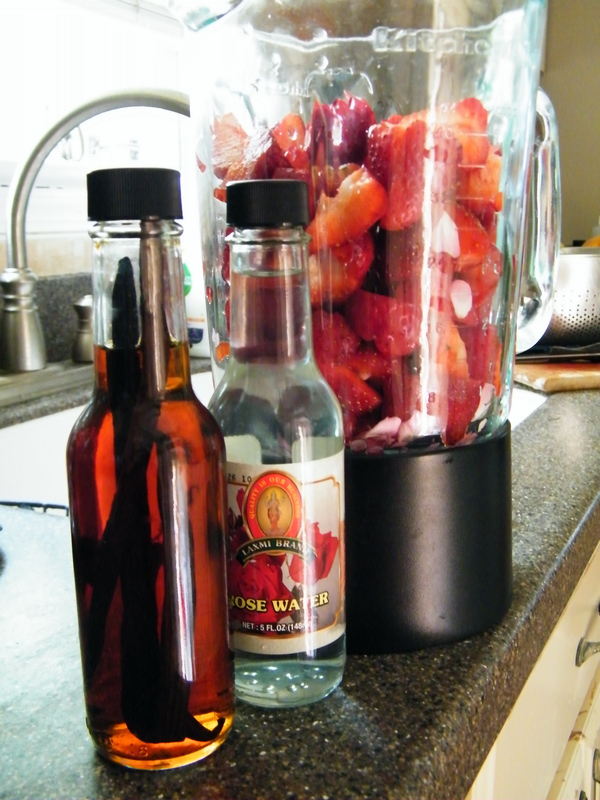 Add 1 teaspoon each of rose water and vanilla extract (I made my own by soaking 2 vanilla beans in a small bottle of brandy for 6 weeks) to the strawberries and roses. Puree until smooth. Add the yogurt and maple syrup, and blend until well-mixed. 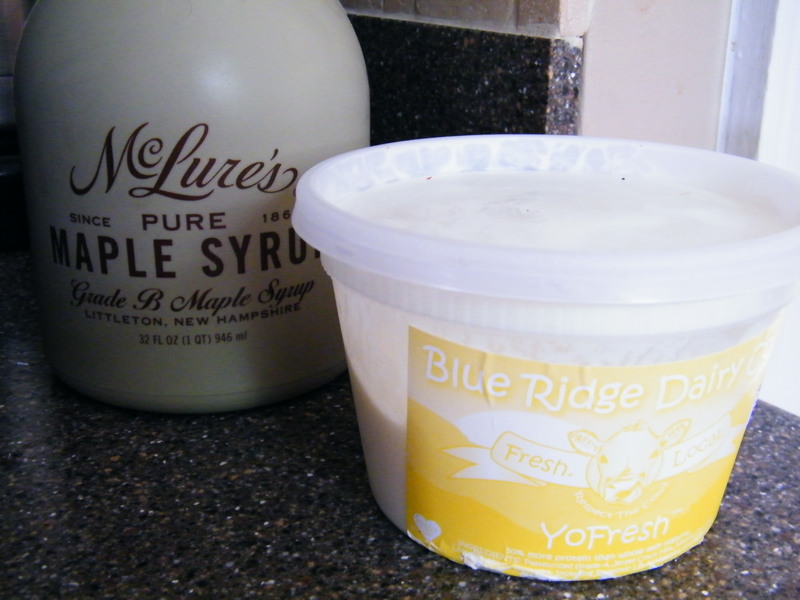 (I’ve been using yogurt from Blue Ridge Dairy. All of their products are amazing, their cows are very happy, and their representative at my farmers market looks like Francis from Malcolm in the Middle :-). 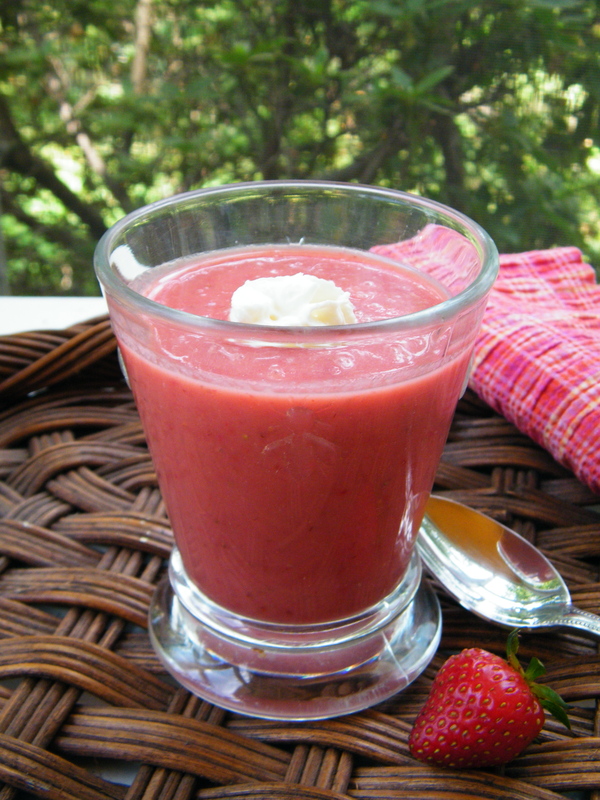 You can add more strawberries at this point since you will have more room in the blender. Chill, then serve garnished with a dollop of yogurt. Enjoy! The following post is by guest blogger, Kia Guarino. Known as Thalassotherapy, the practice of bathing in salt water is not only relaxing, but it also increases blood circulation, and helps the body eliminate toxins. It also activates the body’s own healing mechanisms, strengthening the immune system. Salt water has desirable beauty benefits as well since sea salt granules can act as an exfoliant scrub, removing dulling skin cells. Bathing with bath salts improves skin’s look and feel, resulting in a radiant, healthy glow. 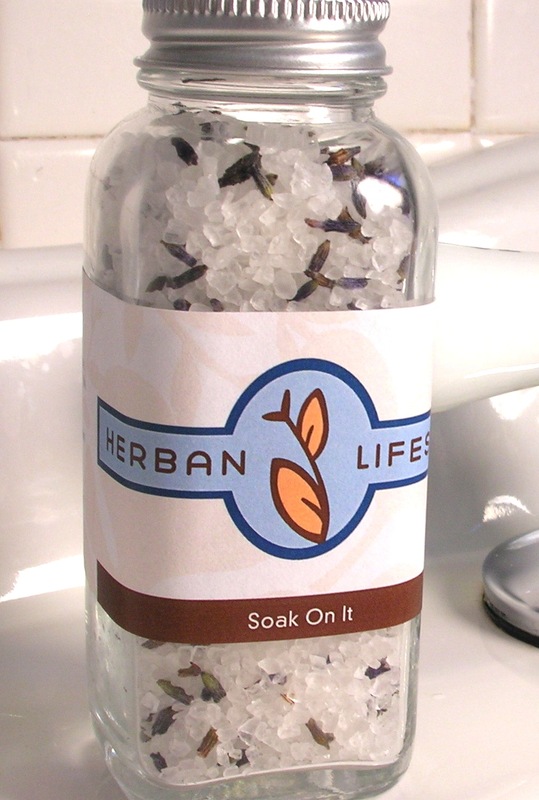 As an added benefit, Herban LifestyleTM bath salts are made with essential oils that enhance salt’s natural healing powers. Lavender, for example, offers amazing natural benefits. Beyond its enchanting scent, lavender helps rejuvenate skin while clearing up problem areas. It also encourages balance for the nervous system and has been used as a powerful antiseptic and pain reliever. Most notably, however, lavender’s natural soothing properties help reduce stress, especially when added to a hot bath. Tangerine is another of nature’s miracles. With a delicious and invigorating scent, tangerine helps to prevent heart disease and to reduce the risk of cancer through its abundance of antioxidants. Although these benefits can be received through consumption, the rind is where most healing powers are stored. 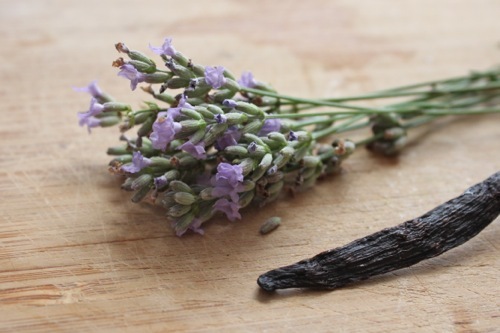 Finally, vanilla is another ingredient that does more than please the nose. As one of the most powerful natural healing plants, vanilla has been shown to provide antioxidants and anti-depressant properties. It also acts as a tranquilizer and fever reducer. When in a bath, vanilla can increase muscle energy and lower blood pressure, while relieving emotional stresses such as anxiety and anger. With all of this amazing healing power found in nature, it is time that people got back into baths! For relaxation in mind, body, and soul, all natural scented salt baths are an inexpensive, convenient, healthy and easy solution.